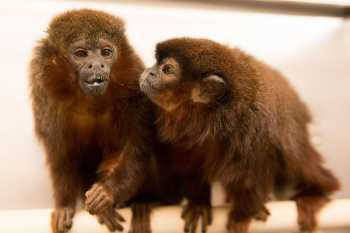 Response: Titi monkeys are a socially monogamous species in which adults form pair bonds. In my laboratory we are studying the neurobiology of pair bonding, and understanding jealousy is important because it’s one mechanism by which the pair bond is maintained. In this study, male titi monkeys viewed their pair mate next to a stranger male, and we examined the neural, behavioral, and hormonal consequences. Response: Male titi monkeys in the “jealousy” condition had higher activation in the cingulate cortex, which is an area of the brain activated by social exclusion in human studies. They also had higher activation in the lateral septum, an area that seems to be particularly important in our studies of primate pair bonding (in that it seems to be involved in both the formation and the maintenance of pair bonds). Jealous males had a rise in testosterone as well as a rise in cortisol (stress hormone). The more time that they spent looking at their pair mate next to the stranger male, the higher their cortisol rose. Response: It appears that the neural substrates of jealousy are probably similar in humans and titi monkeys. This is important because we need non-human primate models for the neurobiology of social bonds; previous studies have almost entirely been done in rodents. Response: We need to know if females have the same neural substrates for jealousy as males do. We also need to understand how being jealous can sometimes develop into intimate partner aggression. Disclosures: This study was funded by the National Institutes of Health, grants HD053555 and OD01117, and by the Good Nature Institute. This entry was posted in Author Interviews, Psychological Science, UC Davis and tagged jealousy, mating, neurobiology, psychology by Marie Benz MD FAAD. Bookmark the permalink.